This was my first Warwick Parish Network Symposium having recently joined My-Parish.org and during discussions I had the opportunity to refer to my ongoing research at both Catherington, Hampshire and Firle, East Sussex. In a break I had a discussion with Elizabeth Norton from Kings College London (who gave a paper on “The Manor and the Parish: Local Organisation in the Sixteenth Century Through the Example of the Blount Family”) about the recusancy of John Gage the Younger as Elizabeth had touched on recusancy. In the final paper of the second session Jörg Widmaier of Eberhard-Karls-Universität, Tübingen talked about “The Gotlandic Parish: Concepts of Identity and Social Differentiation.” This included his study of the adaptation of sacred space by members of the laity in the Reformation / post-Reformation period and in the ensuing discussion I made a comment about lay appropriation of sacred space in the Hyde chapel at All Saints, Catherington, Hampshire. “The N arcade continues without a break into an E bay [the largest bay] opening from chancel to chapel and ends very curiously, in a further bay of about half the width of the others and correspondingly lower, although the details are similar.” (Pevsner & Lloyd: 1967, 159). 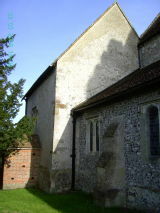 Based on my dating of the chapel to c.1064, which would give it a terminus ante quem date to the chancel and nave, I have suggested that the Norman builders of the chancel and nave sought to equate their sacred space of the chancel with that of the earlier chapel by knocking through the south wall of the chapel to the greatest extent possible which would explain why this bay is the largest in the church; especially if the chapel had been built by Edward the Confessor as this was another way of equating and legitimating their rule with that of Edward all be it at a local level. If the sponsor for the Norman chancel and nave was Earl Roger who held the hundred of Ceptune after the conquest, then it could be argued that the equation of the chancel with the sacred space of the chapel was a form of lay appropriation. The presence of the smaller half bay to the east of the large bay is evidence of the separation of clerical and lay portals between the chapel and the chancel, given the proximity of this half bay to the east end of the chancel it is probable that this would have been reserved for exclusive use by the priest. Moreover, in the post-Reformation period the chapel acquired lay appropriation of its space when the tomb of Sir Nicholas Hyde of Hinton Daubnay a hamlet to the NW of Catherington who had been Lord Chief Justice and who died in 1631 was erected. In his paper, Jörg Widmaier talked about how during the Reformation and post-Reformation period the laity appropriated sacred space in the Gotlandic churches, such as in the insertion of a gallery into a chancel for the use of the local elite. In considering the former lay appropriation of the late C11th / early C12th of the chapel with the new Norman chancel, Hyde’s tomb can be seen in a similar context, abet in a funerary context. My research into the Gage chapel at St Peter’s, Firle has revealed a similar pattern in its history to that of the Hyde chapel at Catherington. Like the Hyde chapel it lays to the north of the chancel, and to touch briefly on dating matters it is proving harder to date because there have been changes to the NW quoin column, with some of the higher quoins having been replaced at some point; whilst most of the NE quoin column is hidden by the addition of a double faced buttress of c. C18-19th date and built to prevent the chapel from collapse as it had the combined weight of the latter chancel and nave pushing against it. Also like the Hyde chapel there is a connection with Edward the Confessor, the entry in the Domesday Book for Sussex states that Edward gave Firle to Wilton Abbey (Morris:1976, 56, folio 19 a,b). However, unlike the Hyde chapel at Catherington, it has been difficult to construct the relationship of the sacred space in the Gage chapel and the chancel, the two spaces are divided by a two bay arcade which is not only separate from the nave’s north arcade but also of a different date. In the first edition of the Buildings of England: Sussex, Ian Nairn thought the arcade between the chapel and chancel to be late Perpendicular (c.C15th-mid C16th) (Narian:1965,623), but the architectural historian Rodney Hubbuck who has visited the chapel with me believes that they are Victorian (Rodney Hubbuck Pers. Comm.). So until the dating of this arcade can be resolved it is only possible to speculate the construction of the sacred space between the Gage chapel and chancel during the middle ages. Rodney Hubbuck has also dated the stone skirt which encompasses most of St Peter’s including the east and north sides of the Gage chapel as C14th (Rodney Hubbuck Pers. Comm. ), while Ian Nairn argued that the chapel was built in the C16th (Nairn: 1965,623). Further typological research into the stone skirt needs to be undertaken, but this major dating difference is noted here in order to highlight the extent of the problems in dating the Gage chapel. In turning to the matter of the use of the Gage chapel as sacred space especially in terms of lay appropriation during the C16th and early C17th, the evidence is clearer. The chapel is dominated by the table tomb of Sir John Gage KG, a second rank Catholic courtier who died in 1557. In his will, Sir John left instructions that a chantry was to be established to commemorate him in the parish church. Chantries had of course been dissolved and abolished during the reign of Edward VI, and this instruction gives an insight into Sir John’s religious mind set indicating that perhaps he expected Mary to reinstate chantries as part of her policy to return England to its Catholic roots. The chantry was never constructed and Sir John’s grandson, John Gage the Younger suffered 39 years persecution as a recusant, but in the 1590’s he instructed the Flemish artist Garrat (or Gerard) Johnson who was a member of the entourage of John Gage the Younger’s relative Viscount Montague (Questier:2006, 207-8) to design a table tomb for his grandparents and two smaller tombs for his parents and himself and his two wives. The plans that Johnson drew up are extant and survive at Firle Place the seat of the Gages in Firle. They are annotated around the outside with the hand written discussions between John Gage the Younger and Johnson over the design of the three tombs. The plans provide evidence that John Gage the Younger was very specific when it came to what he wanted in these memorials to his family even specifying what design of hats his two wives should be portrayed as wearing on their images on the memorial brass on their tomb. The plans show that the east elevation of the table tomb of Sir John and his wife Dame Philippa would have had an inscription, which points to the tomb originally being placed in the centre of the chapel. It has since been re-located to the SE corner of the chapel, probably in the C19th to make space in the chapel either for a poor school that Lady Gage established or to accommodate the organ box when the organ box was inserted into the western bay of the two bay arcade between the chapel and chancel (the presence of the organ box in this location is another obstacle to dating the arcade and evaluating the relationship of the sacred spaces of the chapel and chancel in the middle ages). The discussion between John Gage the Younger and Johnson as recorded on these plans therefore provide primary evidence of how John Gage the Younger sought to appropriate this sacred space for the lay commemoration of his family. I have suggested that despite the many years that he was persecuted both financially and through imprisonment for his obstinate recusancy in having these tombs built in the chapel and in particular the grand tomb of his grandparents that he probably saw himself as fulling his grandfather’s wish and whilst not a chantry commemoration one that fitted in with the current culture of commemoration for funerary monuments (Winslade: 2012: 19-25). My research into these two chapels is ongoing, but to date I have been able to construct an outline of lay appropriation, at Catherington for both the late C11th / early C12th and early C17th. At Firle research is on-going into both the appropriation and application of sacred memory to the spaces of the Gage chapel and chancel for the late C11th / C112th and the late C16th / early C17th.